This slightly tighter woven mesh is designed to control small insects----gnats, no-see-ums and small mosquitos. While a tighter mesh, this screen still allows good ventilation and visibility and provides some daytime privacy. Phiferglass is woven from permanent glass yarn, then coated with a protective vinyl to ensure lasting beauty, colour and flexibility. The standard Fiberglass screen is the mesh applied in most windows and doors. It is non-combustible, will not rust, corrode or stain. The protective vinyl coating ensures lasting beauty, colour and flexibility. It is easily fabricated and is the preferred insect screening in the fenestration industry. This standard fibreglass screen is the mesh applied in most windows and doors. Easily fabricated, this high quality standard mesh is the preferred insect screening in the fenestration industry. Phiferglass is woven from permanent glass yarn, then coated with a protective vinyl to ensure lasting beauty, colour and flexibility. Protecting people from annoying and often disease-carrying insects, Phifer's Aluminum Screen sets the standard for the screening industry's level of quality and dependability with the production of a precision woven and uniform coated screen mesh. Phifer has been supplying aluminum insect screening to the United States and the world for over a half century. Aluminum screening is suitable for all window, door and porch applications and is available in three colour finishes. Phifer 18x14 Pool and Patio insect screen is stronger than standard insect screen. It is ideal for large openings that require extra strength such as pool, porch or patio enclosures. Precision woven fibreglass screen ensures lasting colour, flexibility and curb appeal. 72-inch x 25 ft. Fiberglass Charcoal 20x20 Mesh Screen This slightly tighter woven mesh is designed to control small insects----gnats, no-see-ums and small mosquitos. While a tighter mesh, this screen still allows good ventilation and visibility and provides some daytime privacy. Phiferglass is woven from permanent glass yarn, then coated with a protective vinyl to ensure lasting beauty, colour and flexibility. 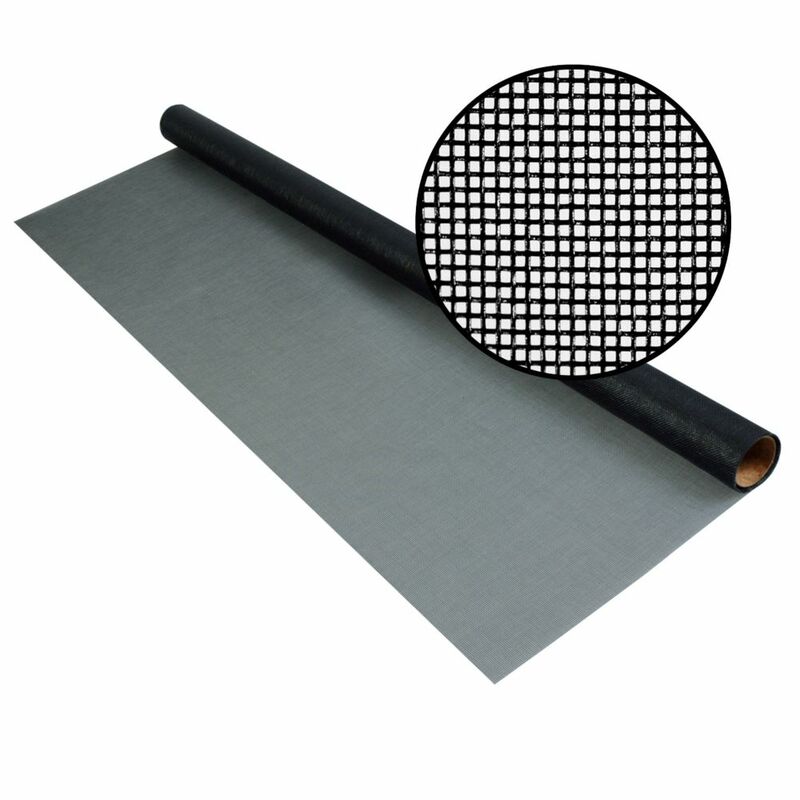 72-inch x 25 ft. Fiberglass Charcoal 20x20 Mesh Screen is rated 4.7 out of 5 by 46. Rated 5 out of 5 by Michael from Really thick stuff. Whatever Spline you plan to use knock... Really thick stuff. Whatever Spline you plan to use knock it down .01. My frames called out 0.17 spline and it was just a little too thick with this screen. I switched to 0.16 and it was just right. Rated 5 out of 5 by Elaine from Easy to install and looks fantastic!... Easy to install and looks fantastic! Rated 5 out of 5 by HomeDepotCustomer from Amazing product!... Amazing product! Rated 4 out of 5 by Harryover1 from seems to be of excellent quality. No runs or other mishaps like Iv'e seen in others. Only thing ... seems to be of excellent quality. No runs or other mishaps like Iv'e seen in others. Only thing I found troublesome is the 25 foot limit. Not much for the outrages price of each roll. Rated 5 out of 5 by Fran from It is of good guilty and works as it should.... It is of good guilty and works as it should. I have not been in an area with no seeums yet so the true test is yet to come.